There are a lot of cuts of beef out there labelled Steak. This glossary helps you find the right cut for the right occasion and then learn the best way to cook it to make the most of the investment. Named for the "7" shaped cross-section bone that runs through this cut. The 7-Bone Steak comes from the shoulder primal and is generally too tough to do anything but braise. This steak is cut from the bottom of the round. This is generally a tough steak that should typically be braised and not grilled. While you can soften this cut up with a marinade, this is a steak that should be used for stews or other dishes where it will be cut up before being served. Chuck Steak Raw. Regarding BBQ Inc.
Cut from the larger of the chuck shoulder roast, this steak is usually no more than an inch in thickness. Typically weighing in around 10 ounces this steak usually has very little fat. Like other steaks of the chuck primal, this steak has loads of flavor but tends to be tough. This is an excellent steak for braising but is equally great on the grill. This might just be the most famous steak if it weren't called by so many different names, more commonly called a New York Strip Steak. As the name implies the Top Loin Steak comes from the top of the short loin primal. This is a tender, flavorful is certainly a favorite and is one of the most versatile steaks. The Chuck Eye Steak is cut from the chuck eye roast (Chuck Primal), lower down from the rib primal. This means that this steak is a similar cousin to a Rib-Eye Steak but isn't as tender or flavorful. A good lower cost alternative. Flank Steak Raw. Regarding BBQ Inc. The flank steak is technically not a steak but has become so popular in the last few decades that it can't be ignored. The flank is the belly muscle of the cow and is typically cut into small pieces. The flank is very flavorful but contains almost no fat and will be tough pretty much no matter how you cook it. The Hanger Steak has started to become more popular and is showing up on more and more butcher shelves. The problem is most people have never heard of it and don't know what to do with it. This Diaphragm section is very flavorful but can turn out dry and tough if you don't prepare it correctly. This steak obviously got its name from an advertising executive since it isn't actually anything like tender. This tough little steak comes from the point of the chuck primal next to the Top Blade. The Porterhouse is kind of a composite steak coming from the point where the tenderloin and top loin meet. Basically an over-sized T-Bone steak the porterhouse is thicker cut and has much more of the tenderloin relative to the loin portion. If you remove the bone and cut out the two steaks that basically make up this steak you will get a tenderloin steak and a top loin (or New York Strip Steak). Rib Steak Raw. Regarding BBQ Inc. This steak is the same as the Rib-Eye Steak with the bone still on. The Rib-Eye is cut from the roast that sits at the top of the rib primal. As a roast is known as a standing rib roast or, more commonly, Prime Rib (though technically only if it is prime grade beef). The Rib-Eye is a boneless cut. When the bone is attached it is called a Rib Steak. Typically this is a thin steak from the middle of the top round roast, from the round primal. Usually, there is a large circular bone on one end of this steak. The round steak can be grilled or broiled but will need to be marinated. This is going to be a tough steak and ideally is braised. Cut from the tip of the round primal, the round tip steak is typically untrimmed (still has fat along the end). If trimmed it can be called a trimmed tip steak of ball tip steak. Because this steak is cut from near the tenderloin it is very tender, and much more tender than other round steaks. This means that this can be a very economical steak. One of the flat steaks the Skirt Steak is tough but wonderfully delicious. If you live in the U.S. (or someplace that learned to butcher from Americans) then the Skirt Steak comes from the plate primal. If you live in the U.K. then it comes from the flank. Either way it has a lot of marbling and connective tissue. This makes it flavorful, but tough. T-Bone Steak. Regarding BBQ Inc. The T-Bone Steak is crosscut from just below the porterhouse and like that giant steak has a section of the top loin and tenderloin (though just a little bit) separated by a t-shaped bone. Fillet Mignon Definition. Regarding BBQ, Inc. This steak is cut from the beef tenderloin, part of the short loin primal. It is greatly desired for being the most tender but of beef. Several steaks are actually cut from this region, the Filet Mignon, Châteaubriand, and Tournedos. The extreme tenderness of these steaks comes at the cost of the flavor (though still very good). Spicy Tomahawk Steak Rub. Regarding BBQ Inc.
Actually a Rib Steak, this cut gets its name from the tomahawk or axe shape. This is a full bone rib chop with the bone end frenched or cut clean. Basically, this is a double thick bone in rib-eye and is perfect for the grill. Flatiron Steak - Raw. Regarding BBQ Inc. Probably one of the must under appreciated steaks, the Top Blade Steak may be more commonly called the "Flat Iron Steak". This tender and flavorful little steak is cut from the top blade roast and comes from the chuck primal. Beef Tri-Tip Roasts - Uncooked. Regarding BBQ Inc. This one steak brings more questions than any other. 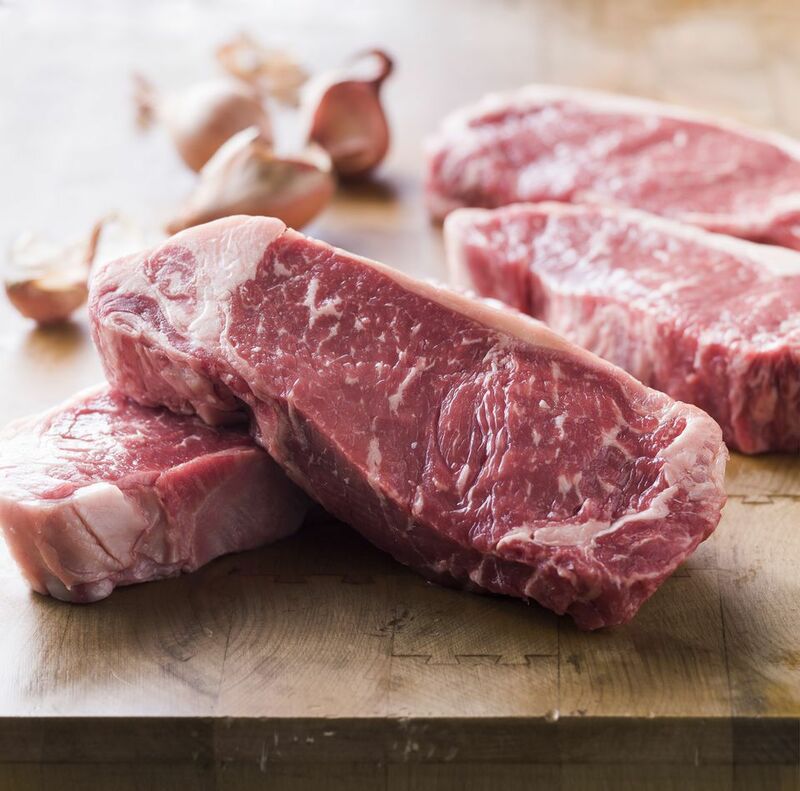 Originally a California cut, this steak (and roast) has become increasingly popular because of the superior flavor and because it is a steak built for grilling. The tri-tip steak is cut from the tri-tip roast. The tri-tip roast is a triangular section of the sirloin primal and comes from the point where the sirloin meets the round and flank primals (tell your butcher this if he doesn't know what a tri-tip is). Cut from the under the shoulder blade, the under blade steak is similar to the 7-bone steak and the top blade steak though not as tender as either. Typically this cut is left as a roast, but can be cut into steaks. This cut is not good for grilling or broiling and should only be braised. What is a Tri-Tip and why is it so good for the grill?